Why pay more for digital signage? Here’s the thing that my friends in Solid Signal’s marketing department don’t want you to know. You don’t need to spend a lot to get good digital signage. Let’s back up a bit, since it’s been a while since we’ve talked about digital signage in this blog. Digital Signage means using TVs instead of bulletin boards, menu boards, or any other sort of informational display. In the last several years it’s gone from basically unknown to being in nearly every restaurant and chain hotel. People like it because it’s interesting; Business owners like it because once you’ve made the initial investment, it’s practically free to change it as many times as you like. I’ve seen a lot of digital signage solutions. Some are done well and some… not so well. The best ones are easy to read and eye catching. The worst ones are just basically photo slideshows full of distorted images. See, like I said, you don’t have to spend a lot to get digital signage. Any TV that can play a slideshow can be a digital sign; any DVD player or streaming device with a media player can be one too. They work ok, as long as you don’t have a lot of information to put out there and people don’t have to read it. This sort of digital sign doesn’t do text very well. So, while you absolutely can get a digital signage player for under $100, I wouldn’t. I wouldn’t trust my business to something like that. 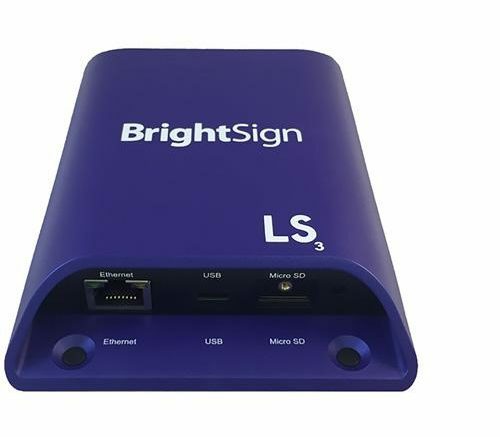 Instead I’d take a look at this Brightsign basic digital signage player. It has almost all of the same features found in the company’s much more expensive media players – it will play videos and display sharp text, it is easy to set up, and it’s well built. It’s worth a little extra money. The difference between Brightsign and less expensive players is in the way you set it up. You can create presentations on your computer or mobile device and then upload them to the player through the network. This makes it easier to set up and maintain. Do you want to change your prices? Edit the presentation and send it up through the network and within minutes your customers see the changes. Networked digital signage solutions are perfect for larger offices as well, because every player can get updated at the same time which is much easier than walking around with flash drives or memory cards and reaching behind the TV to change things. Believe me, the first time you change a presentation on 10 TVs in the same time you’ll be begging for one of these players. If you’re thinking of giving your office a facelift, add a few TVs and some digital signage players from Solid Signal. It’s a great way to show your customers that you’ve really entered the 2010s and it’s really going to make you look your best! SO EXPLAIN THIS TO ME: What’s so special about digital signage?